CWD is a fatal brain disease of whitetailed deer, mule deer, caribou, moose, and elk. It is similar to mad cow disease which occurs in cattle. CWD occurs in wild deer populations in 23 U.S. states and two Canadian provinces, and has been detected in states as close as Pennsylvania and New York. New York has not had a positive case in over a decade, however. CWD has not yet been recorded as being transmissible to people. However, a human variant of the disease does exist. CWD can persist in the environment outside of a host for many years. CWD has a 100% mortality rate in deer. Maine has actively monitored for CWD each year since 1999, and since that time screened approximately 9,000 wild deer. Thus far, Maine proudly remains CWD free. 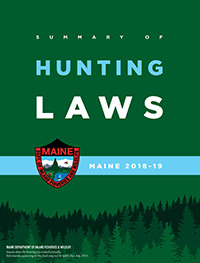 It is illegal for individuals to bring into Maine cervid carcasses or parts, except that the following carcass parts may be imported and possessed: boned-out meat, hardened antlers, skull caps that have been cleaned free of brain and other tissues, capes and hides with no skull attached, teeth, and finished taxidermy mounts. MDIFW prohibits the transportation of unprocessed deer carcasses, and/or parts, into Maine from states that are not directly adjacent to our state. Note: Cervid carcasses or parts from New Hampshire are exempt from this transportation restriction. MDIFW will not transplant deer from other states into Maine. Contact their regional wildlife biologist, or warden, if an animal shows clinical signs of illness, such as loss of fear of humans, drooling, and/or excessive weight loss. Take precautionary steps such as using latex gloves while processing a harvested deer, and sterilizing their equipment following processing. These steps will help to reduce potential transmission of the disease to humans. Again, thus far CWD has not been identified in a person. Avoid consumption of the brain and spinal tissues. Refrain from feeding deer during the winter months, as high densities of deer within a small area can increase disease transmission. Do not use urine-based lures, as CWD has been shown to be spread via bodily fluids. To the best of our knowledge, commercial lures are not currently monitored for CWD. If you choose to utilize a urinebased lure, be certain to place it in a location that deer cannot come in contact with. Feeding deer is prohibited from June 1 to December 15. The Commissioner can stop anyone from feeding deer at any time if there is a public safety hazard or if it is harmful to the deer population. A person may not waste a wild bird or wild animal that has been wounded or killed while hunting. For purposes of this section "waste" means to intentionally leave a wounded or killed animal in the field or forest without making a reasonable effort to retrieve and render it for consumption or use. This law does not apply to coyotes. Our wildlife biologists annually collect information that allows MDIFW to assess the condition and productivity of Maine's deer population. Much of the information we collect comes from hunter-harvested deer. As such, the information you provide us with is used directly for deer management purposes, in Maine. A summary of the information we collect from you can be found within our Annual Research and Management Reports. The Maine Department of Inland Fisheries and Wildlife and the Maine Center for Disease Control and Prevention recommend that the liver and kidneys of moose not be eaten because of possible contamination with the heavy metal cadmium. Also, recent studies have shown smaller amounts of cadmium in liver tissues from Maine deer, and deer, elk and antelope from other states. Maine health officials recommend limiting deer liver consumption to 0.8 pounds in one sitting and 1 to 1 1/3 pounds per week. Human symptoms of acute cadmium poisoning include severe nausea, vomiting, diarrhea, muscle cramps and salivation. There is no known health risk from eating moose meat or deer meat.